Through her installations, performances and sculptures, Los Angeles-based artist Liz Glynn conducts historical research that links our current world to our past. Everything is contemporary at one point in time, and Glynn reimagines how individuals might help shape future outcomes through engagement and imagination. Untitled (Burgher with extended arm), 2014, comes from a series of performances focused on monumental sculptures in the collection of the Los Angeles County Museum of Art. Glynn and her crew cast molds from 19th century French artist Auguste Rodin’s work The Burghers of Calais, 1884-89, using Rodin’s own studio practice of fragmentation and recombination to create unsettling versions of an already disquieting tableau. In the Burghers, Rodin depicts the moment when the French leaders surrender to the conquering British forces who besieged Calais from 1346-47. While Rodin’s work is monumental, its depiction of the heroism of self-sacrifice veers sharply from traditional public sculptures that celebrate history’s winners. Glynn has achieved something very sophisticated in this work. She cannibalizes one of the 19th and 20th- century’s leading sculptors, using his own working processes to make the old contemporary again. 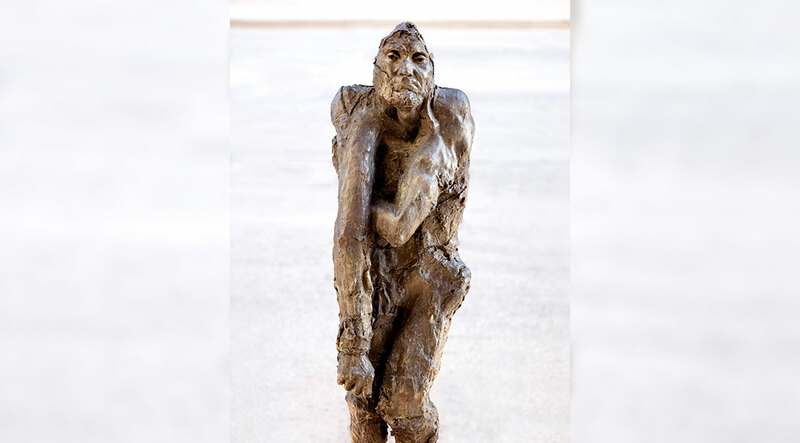 She provides contemporary footnotes to Rodin’s casting process, reminding us that his work has been cobbled together with limbs cast during his life, and by his estate after his death. Glynn reminds us that Rodin himself questioned the myth of a singular image emerging from a singular (male) genius, undermining the very foundations of modernism. And through her work, Glynn mirrors the social fragmentation of Rodin’s time—the upheavals of industrialization, the jarring new forms of art pioneered by Rodin and his contemporaries—through this attenuated body. Her disjointed figure speaks to the social and technological upheavals of our time, each person pulled in different directions by the constantly changing social and economic climate, unable to find one stable image of the world. Los Angeles-based Glynn, born 1981 in Boston, studied visual and environmental history at Harvard and received her MFA at the California Institute of Arts, Valencia. Selected one-person exhibitions have been held at: the Los Angeles County Museum of Art; the Doris C. Freedman Plaza, New York; the Sculpture Center, New York; and Arthouse at the Jones Center, Austin, among others. Glynn’s work has been included in group exhibitions including: The New Museum’s triennial The Generational: Younger than Jesus, New York; Los Angeles Contemporary Exhibitions [LACE]; the Aldrich Contemporary Art Museum, Ridgefield, Connecticut; Otis College of Art & Design, Los Angeles; Villa Romana, Florence, Italy; UKS, Oslo; The Hammer Museum, Los Angeles; the de Cordova Sculpture Park and Museum, Lincoln, Massachusetts; the Carpenter Center for the Visual Arts, Cambridge; and Massachusetts Museum of Contemporary Art, North Adams. Her performances have been included in: black box, the J. Paul Getty Museum’s Pacific Standard Time Performance Art and Public Art Festival, Los Angeles; Performa, New York; Station to Station, Public art project organized by Doug Aitken on a train traveling from New York to San Francisco; Kunsterlahus Halle fur Kunst & Medien, Graz, Austria; on the Highline channel 14, New York; the Barbican Art Gallery, London; the Machine Project & the L.A. Opera Ring Cycle Festival, Los Angeles. Glynn has held residencies and received fellowships from: the Delfina Foundation, London; the Rauschenberg Foundation, Captiva, Florida; the California Community Foundation; O’artoteca, Milan; and the Joan Mitchell Foundation, New York.